After months of waiting by straphangers, the elevators at the new 96th Street subway station opened Tuesday. UPPER WEST SIDE — After months of waiting, straphangers got a welcome surprise at the 96th Street subway station Tuesday: the elevators were running. The MTA unveiled the new station — with a sleek futuristic design featuring public art and landscaping — at an April grand opening. 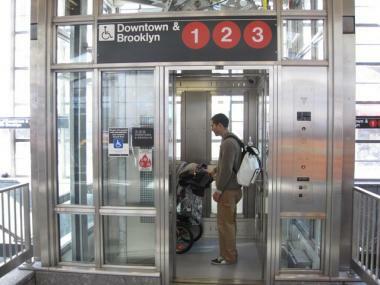 But that ribbon-cutting didn't extend to the station's elevators, DNAinfo reported Monday. An MTA spokeswoman said the elevators would open Tuesday, and they did. Among the first few riders was 75-year-old Erma Blount, who was making her way to a doctor's appointment using a cane for support. "I didn't know whether it would be working today," Blount said. "I was praying it would be." 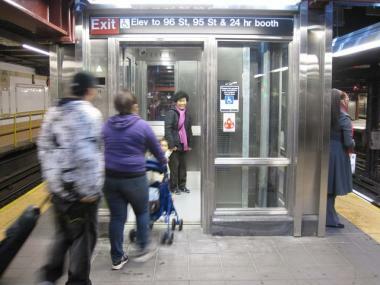 The elevators at the new 96th Street subway station opened Tuesday, after months of waiting by straphangers. Blount said the elevator would make a difference in her life. She stopped using the 96th Street subway station after recent surgery because the stairs were too challenging. Instead, she took three buses to get to her doctor's office. Sam Gross, in his 80s and wheeling a black suitcase, called the new elevators "fabulous." Gross said stairs are difficult for him. "[The elevator] is a big help, especially going up," Gross said. The new elevators are the last piece of a $65 million, three-year renovation at the 96th Street subway station. The station, which serves the 1, 2 and 3 lines, opened in 1904 as part of the city’s first subway line, according to the MTA website.